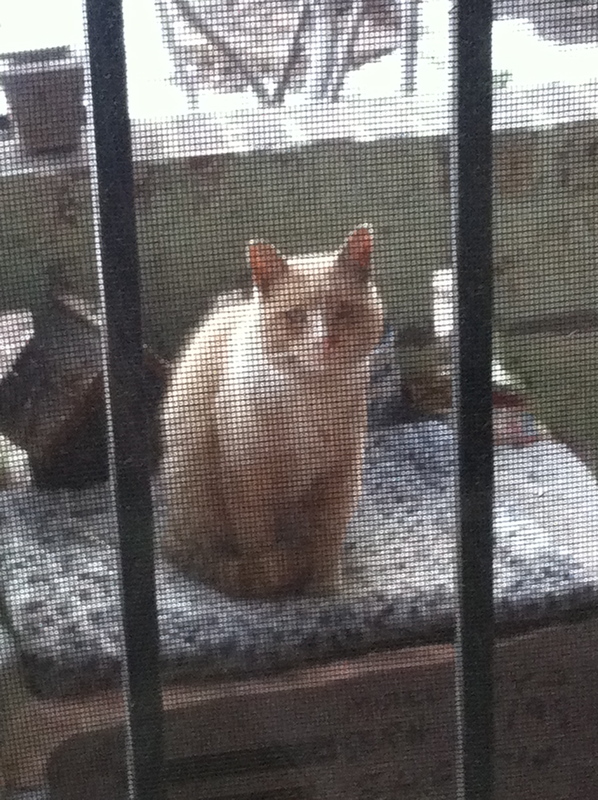 Our yard and garden are full of feral cats. They came with the place when we rented it, and I quickly went to work getting them spayed and neutered, thanks to a discount I receive for being a TNR-certified (that’s trap-neuter-return) volunteer through the ASPCA. 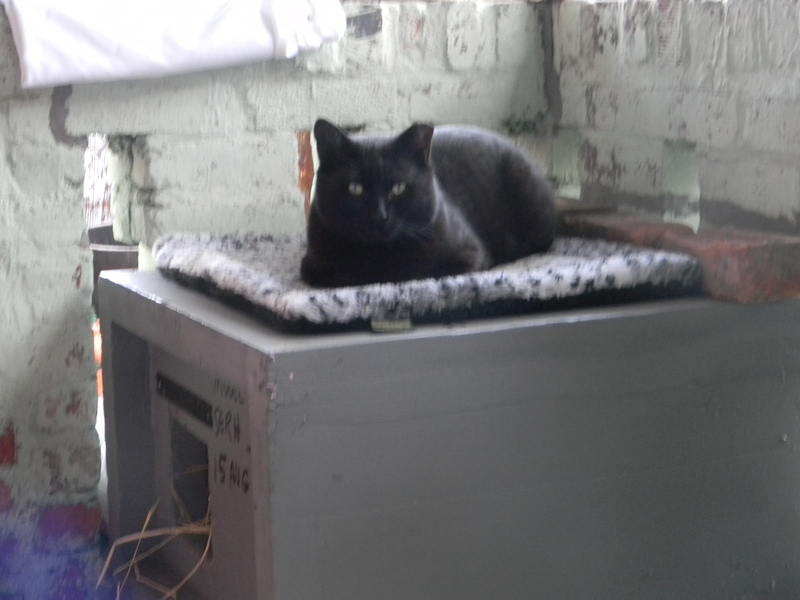 Note his left ear has been “tipped” – this is the universal sign that means “this cat has been spayed/neutered.” If another rescuer were trapping feral cats to have them fixed, she would know right away to let Arthur go because he’s already been done. 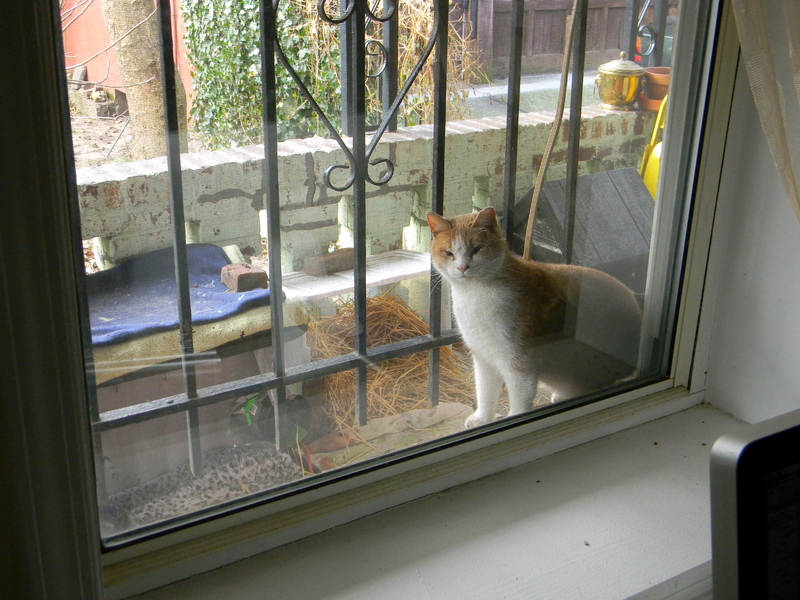 These cats are all very scared of people and it’s highly unlikely they will ever be anyone’s “pet.” Feral cats in NYC have nowhere to go and continue to breed and to suffer hard lives outside. TNR helps to at least cut down on the population. Enzo, the orange and white boy, is blind in one eye from an infection he and his siblings had as kittens. General Sherman, in the background, has no tail. Mr. B and I love these sweet, funny, poor little creatures and are happy to be able to offer them food, winter shelters, and a safe place to live out their days. 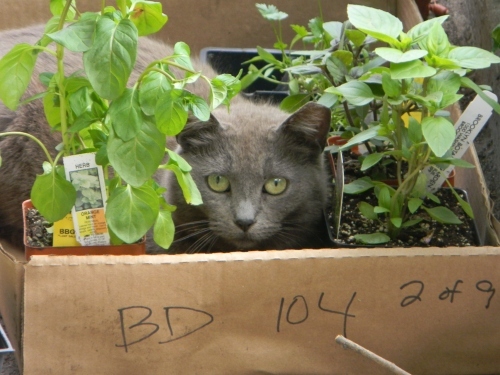 Here is Smoke, hiding in a flat of herb transplants where she can safely keep tabs on me. Most of these cats have come to know me and my voice. Although they won’t let me anywhere near them, they do associate my voice with FOOD, and so they will get very close to me at feeding times. I often have to take pictures through a window, otherwise they would take off running. They’re becoming more and more curious about me and about our indoor cats, though, and they sometimes peek at us through the (closed) windows. Quince looking in at our cats through the window. She is the sister of Enzo and Oscar. The three of them are Clementine's kittens, and all three of them have eyes that are misshapen and have lots of scar tissue due to eye infections, which I had treated when I trapped and had them vetted. They can all see, they just look a little funny, poor things. 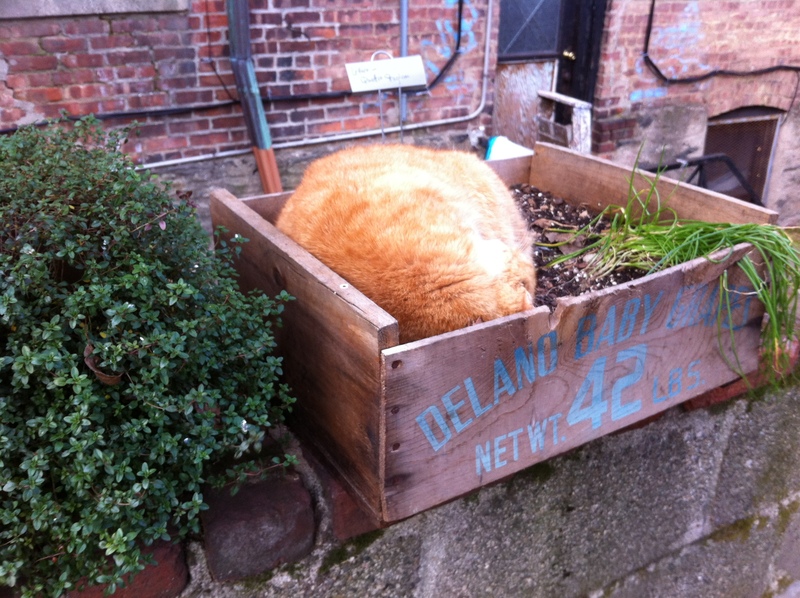 Clementine, their mother, sleeping in the lettuce and chive box on the driveway wall. 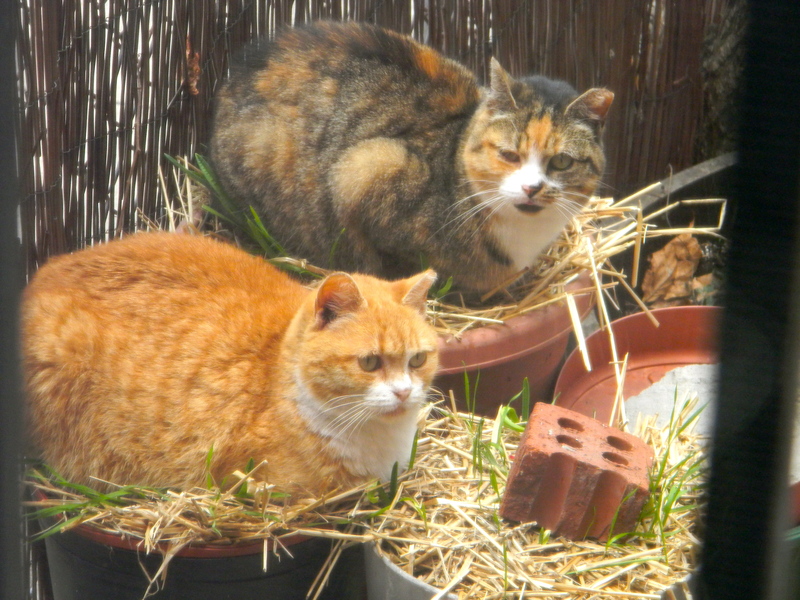 Clementine and Maisy, who I believe is her sister, providing extra "mulch" for my garlic. Amazingly, with all these cats, our yard does not smell! It sure did when we first moved in, but getting them fixed took care of spraying and marking territory. Cats are clean animals and generally don’t want to go to the bathroom anywhere near where they live or sleep. They have the whole rest of the block of backyards as well, which they can explore, but the food, our winter shelters, and our shady fig trees in the summer make our yard the one where they choose to sleep and play. They all love catnip, and the 3 “kittens” love chasing leaves blowing in the wind, and play-wrestling together. I love seeing them having some degree of comfort in their poor lives and that they feel safe enough to play. Mushy, the only friendly one in the bunch. I've taken him to the vet and tried, unsuccessfully, to find a home for this poor guy who I am told has lived outside on this block for 4 years. 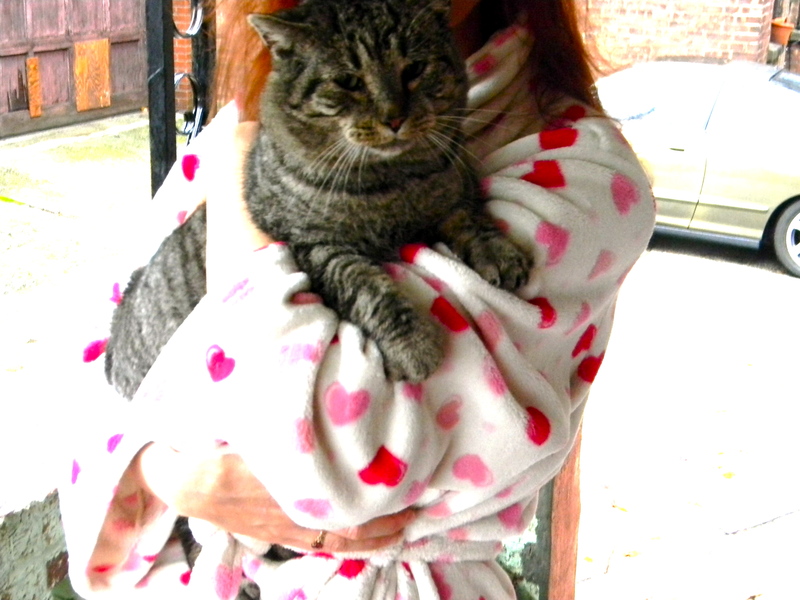 He has FIV and some dental issues, which makes it hard to find someone willing to adopt him. We give him as much love as he'll take, which is generally a lot. Midnight was a bit luckier. He was the only other friendly cat, and he managed to find a home. He now lives indoors and has a black lab buddy! Not pictured here: Oscar, Merv, Angelo, Jinx, Barley, Millie, and Suzie! They spend most of their time in the yard of a neighbor who also takes care of cats, and they are only occasional visitors to our yard, but I’ve had them all fixed anyway. 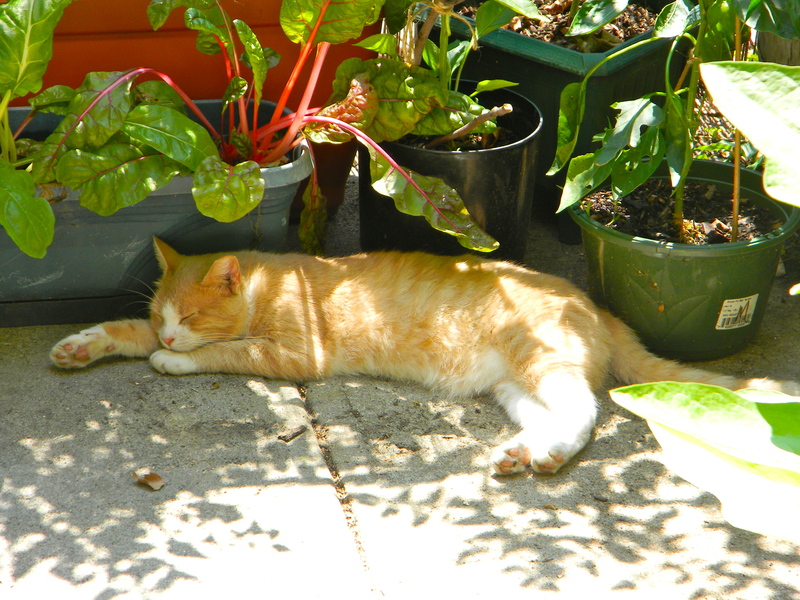 Our permanent residents include the 6 orange cats: Rusty, Arthur + Clementine (mom and dad), Quince, Enzo, and Oscar (the “kittens”), plus Maisy and Mushy. You can watch a video of them all being served breakfast in an upcoming post! Stay tuned! 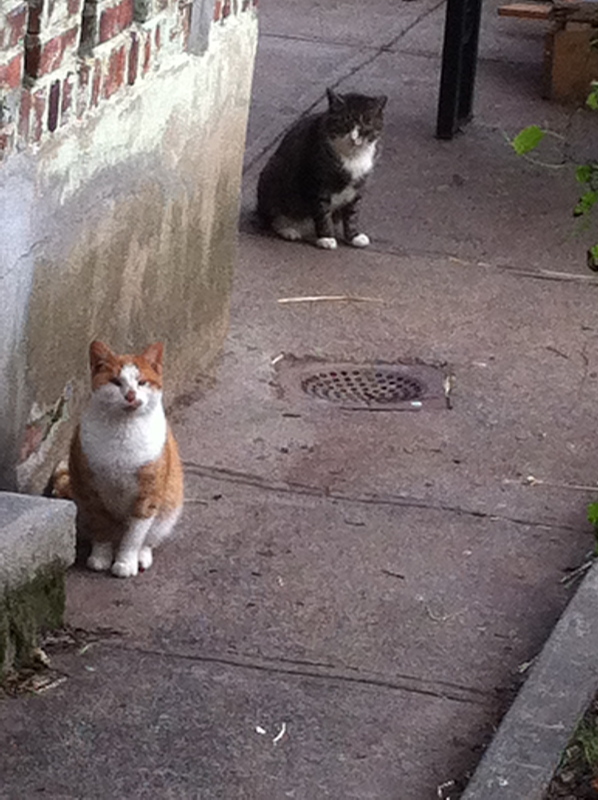 My sister lived in Brooklyn Heights many years ago and she, too, had feral cats in her back yard(s). As a matter of fact, a cat she adopted off the street as a kitten was with her (and, later, my mother) for 13 or 14 years before she died in 2008. She always fed the ferals, but I don’t recall her catching any of them. You’re wonderful to take care of them. Thanks for stopping by, Tricia! And thanks for your kind words about the cats. It’s nice to hear your sister helped them out too. They are a lively, sweet, silly bunch and we are glad to give them a safe and protected place to live out their days. We’ve really come to love them all. What a treat to meet them all, and to observe the link between them and your garden, both the lucky recipients of your care, attention, and love. Thanks for stopping by, Teresa! I’m glad you can see some of lucky recipients of your kind and generous food donations! I wish I could get better photos…we are limited to taking pictures through the window screens because they all scatter when we go out the back door. Yes, they are lucky cats, but I feel like the lucky one being able to offer them help. My sister’s family lives out in the country in SE New Mexico, and they have a lot of feral cats on their property. After one of them had kittens, my sister had them spayed and neutered, too. She still ended up missing one, which had another litter, and for a while at breakfast time her back porch would have thirteen almost identical black cats sitting in a straight row in order of size and seniority waiting for their food. In a children’s fantasy novel about cats (by Diane Duane? can’t remember–sorry!) the cats play games that are all about positioning–if a cat sits on the top step, then the cat who was on the third step two houses down has to move over to the window box that sits a little higher than the top step, or it loses points. (Something on those lines.) All to say, your feral cats seem to be experts at The Game. Hi Stacy, thanks for visiting! That is so cool that your sister’s family helps out feral cats in NM. It can be a lot of work trapping them all to be spayed and neutered, but it’s the thing that really makes a difference in the number of cats competing for food and shelter and cuts down on their suffering. That is hilarious that your sister’s feral cats are all black! I love that they line up by size for food! Ours seem to change their line-up from time to time, although hissy little Maisy is always first in line at the door and to the plate. The book you described sounds great – I’ll have to check it out! Thanks for the tip!